I am a sucker for anything fatty, creamy, and cold…Ice cream? Yogurt? Mousse? YES PLEASE! But fear not! I have a solution to those sweet tooth cravings! A lighter than air dairy free, sugar free, paleo coconut chocolate mousse! Yes this is happening people. You can even layer this mousse with some pomegranates, more melted chocolate and nuts to make parfaits suitable for a dinner party! Lets get creative people show me how you do it! In a large mixing bowl beat the egg whites until firm soft peaks are formed. With the mixer running slowly stream in the sweetener of choice and continue to beat until firm peaks are formed. Remove the tops of the coconut cream and scoop of the solidified cream on the top, leaving the coconut water on the bottom. Beat the coconut cream until light and fluffy. Melt the chopped chocolate over a double boiler or by placing in the microwave for 15 seconds. Stir the chocolate and keep microwaving for ten second intervals stirring in between until fully melted. Stir in the vanilla extract and the espresso powder. Once the chocolate is cooled fold it into the coconut cream. In 4 stages fold in the egg whites very gently into the chocolate coconut cream. Its ok if there are streaks of egg whites. You are looking to build volume. Once all of the egg whites are incorporated into the cream portion the mousse into the serving cups of choice and place in the fridge to set up for minimum of 30 minutes. You can chill the mousse in the bowl and then construct parfaits by layering the mousse with chopped nuts, chocolate chunks, pomegranates or any fruit and nut combo you like for a dinner party ready dessert. Who says you can’t have your pie and eat it too? What was that? Oh the saying is cake not pie? Well then all the reason why you can have seconds! 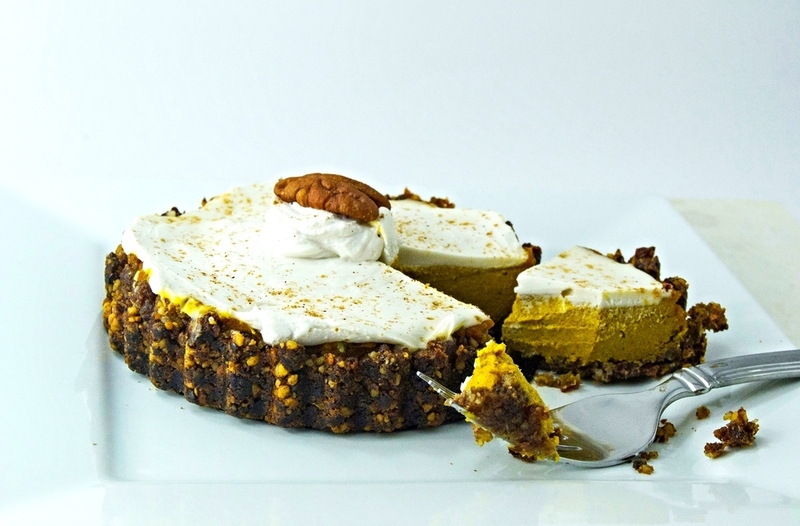 Check out these little pecan crusted pumpkin pie beauties free of dairy, grains, sugar, and gluten but jammed with rich, decadent deliciousness. How did I do it? Wouldn’t you like to know! Oh and I made mine into individual tarts because I like to feel like a giant when I eat little things, but if you want to serve a regular pie use a 9’‘ spring form pan and pour the filling in and bake for 20-25 minutes longer or until the center is set and a toothpick comes out clean. In the work bowl of a food processor add the dates, pecans, and salt and pulse until the pieces are finely ground and it holds it shape when pressed between your fingers. Grease the tart shells and evenly divide the crust between the shells. Press the crust up the sides and firmly into the bottom as evenly as you can. Drain the nuts and rinse off. Add the remaining ingredients to the work bowl of a blender and puree until smooth. Taste for sweetness and adjust according to your palette if necessary. Place the tart shells on a sheet pan. Pour the filling evenly between the tart shells. Bake in the oven for 25 minutes or until a toothpick comes out cleanly. This recipe can be made into one large pie. Use an 8'' spring form pan and press the crust into the bottom and up the sides. Pour all of the filling in and bake for an additional 15-20 minutes or until a toothpick comes out clean. You may think I’m crazy for putting beets into chocolate and making a pudding, but don’t knock it until you try it. I do have a love for beets in general but a friend of mine turned me on to the combination of chocolate and beets and it really is a match made in heaven! This recipe would be perfect for curbing a sweet tooth but I actually think this is the PERFECT pre workout snack. Beet pudding before a workout? Really? Beets are high in nitrates and this creates a chain reaction where the body converts the nitrates in into nitric oxide. Nitric Oxide is a compound that enhances blood flow throughout the body and helps lower blood pressure. Many body builders take nitric oxide or pre workouts supplements that have nitric oxide for enhancing their workouts. The increase in blood flow yields better lifts for weight training and better blood flow for cardiovascular events. In addition to the increase in blood flow there is a nice balance of carbohydrates from the beets, energy boost from the cacao/chocolate, and vitamin C from the raspberries that give your body the proper balance for a killer workout. You could also eat this after a workout with some protein powder mixed for a complete post workout snack. I have been eating this for breakfast all week with some chopped almonds or hazelnuts on top and it is RIGHTEOUS! I feel so clean after I eat this and ready to take the day on. Here is a link to a post I did about the health benefits of beets in pre and post workout nutrition. Steam beets in a steamer over simmering water for 10-15 minutes or until a knife is easily pierced through the skin. Allow to cool. Slice the beets into small pieces and place in the work bowl of a blender. Add the remaining ingredients to the blender and puree until smooth and creamy. Taste for sweetness and adjust if necessary. If seeds bother you, heat the raspberries in a pan until softened with 2 TBL water and then mash with a fork. Strain the raspberries into the blender through a sieve to remove any seeds, pushing the solids with a spatula. I have my mind on my candy and candy on my mind. It’s that time of year….the time when most stores you walk into are filled with candy, candy, and more candy. Halloween is the precursor for the upcoming holiday season….the season of eating. Don’t get me wrong I love the holidays, and I like to indulge, but I like to control the ingredients and keep the junk out of my mouth and away from my hips. You feel me? 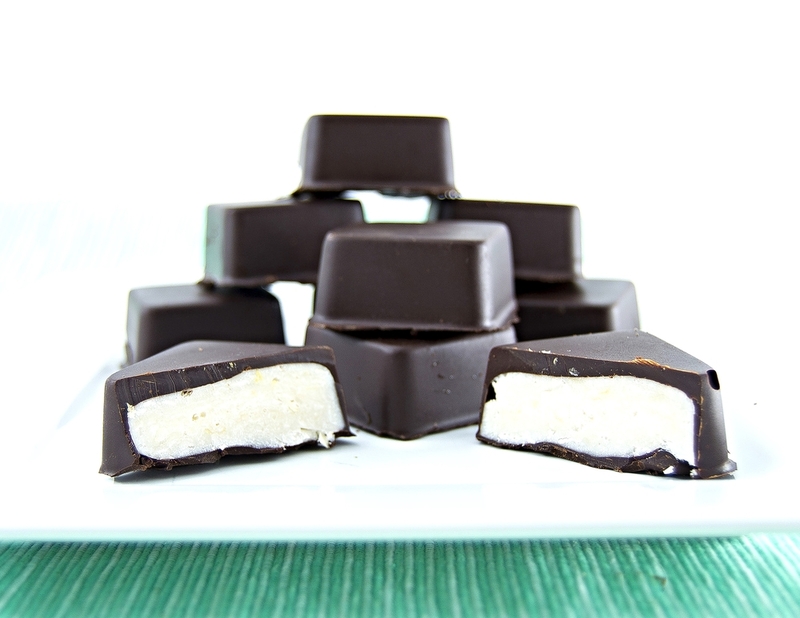 I wanted to start with one of my families favorites the refreshing, sweet and sinful peppermint patty. Feel the chill and float away on a rich bed of chocolate and creamy mint without any of the guilt…isn’t life grand? Oh and don’t worry if you don’t have a chocolate mold I have instructions for making these without one. If you feel so inclined here is a link to buy the one I use its only $9 and it really makes your candies and chocolates look very professional. In the bowl of a food processor add the coconut flakes, coconut oil, vanilla and peppermint extracts, stevia, 1 tbl maple syrup, salt, and blend until the mixture is smooth. Taste for sweetness and mint intensity. Feel free to add more of both depending on your palette. Place the coconut mixture in the fridge to firm up while preparing the chocolate for at least 20 minutes. The mixture should be firm while soft enough to scoop with a spoon. If the mixture if made ahead of time allow it to sit out on the counter before using. Add the oil to the chocolate and stir until it is completely melted. Remove the chocolate from the heat and stir in the maple syrup and a pinch of salt. Pour the chocolate into the mold and swirl around over a bowl or something large enough to catch the excess. Using a flat edge spatula or a bench scraper or even the back of a butter knife scrape the excess chocolate off of the mold. Place the chocolate in the freezer to firm up for 10 minutes. Remove the chocolate and scoop the coconut mixture into the molds filling almost to the top of the molds. Return the mold into the freezer to firm up for 15 minutes. Remove the mold from the freezer and pour the remaining chocolate over the pieces and scrape off the excess so there is no visible coconut. Return to the freezer to firm up for an addition 15 minutes. Pop the pieces out of the mold and keep them stored in the fridge. Line a sheet pan with parchment or wax paper. Scoop heaping tablespoons of the coconut mixture (it should be firm enough to hold a shape) leaving 1/2'' in between. Place in the freezer to firm up for 20 minutes. Remove from the freezer and pour the chocolate over each coconut mound making sure to cover every inch. Return the chocolates back to the freezer to firm up for an additional 15 minutes. Keep the chocolates in an airtight container in the fridge. Peppermint extracts can vary in intensity so I advise to start with 2 tsp of extract then taste the mixture. You can always add more but if you add to much the batch can be ruined so add 1/2 tsp at a time to increase the mint flavor. Do you know this scenario? Whats the solution? My low-calorie, sugar-free Mint Chocolate Pudding silly! This 5 ingredient wonder can be made in large amounts so you will be prepared the next time you have a late night craving. Grass Fed Gelatin – 25 calories for 1 Tbl and a great source of collagen for healthy skin, bones, and nails. I really love Grass Lakes Gelatin because it is sourced from grass-fed beef cows and is Kosher. Raw Cacao – Low Calorie high fiber superfood packed with antioxidants and deep chocolate flavor. In a small bowl measure out 1/2 cup of the almond milk add the gelatin and whisk to combine. In a medium size sauce pan heat the remaining 3 cups of almond milk over medium high heat. Whisk in the stevia, cacao powder and salt into the almond milk. When the almond milk has just come to a simmer add the gelatin mixture scraping the bowl making sure to get all of it out of the bowl. Whisk throughly and heat for an additional 30 seconds to melt the gelatin. Remove the pan from the heat and stir in the peppermint and vanilla extract. Pour the pudding into a glass container and place in the fridge to set up for 3 hours. The pudding is ready to eat when it jiggles and holds together when scooped. Feel free to use coconut milk for a richer pudding. 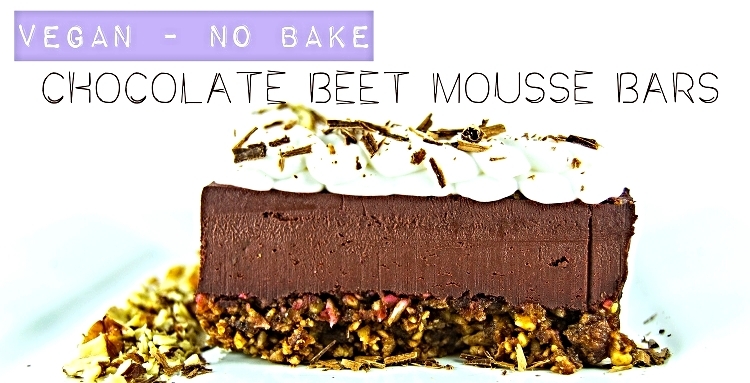 Decadence in Disguise....Chocolate Mousse Brownie Bars with Beets! I have this odd craving lately and it’s not chocolate or ice cream or cake…its for beets. I can’t stop eating them, juicing them, and now I have started putting them in my desserts! Whaaaaa??? Yeah you heard me right, but hey when somethings good why not run with it? Less is more you say? This is America….More is More! So stick with my kids because I’m putting beets in my ultra rich and chocolate mousse bars with a pecan coconut crust and guess what? Your going to fall madly in love with beets just like I have. Have a non beet lover in the group? 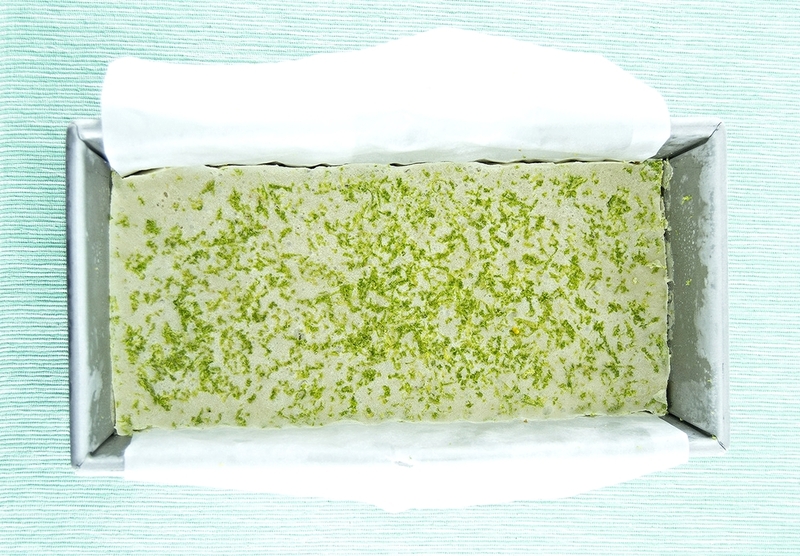 Have them try this mousse bar and don’t tell them what the magic ingredient is. Shhhh I won’t tell if you won’t. Now go get some beets steaming so you can make a puree. The rest of this recipe is made in a blender and the crust comes together in minutes in a food processor so this recipe is easy breezy. Yep this baby is a no bake, vegan, sugar-free, gluten-free, grain free dream that tastes so decadent you will forget that it’s actually good for you. Line a 9x4 standard bread pan (I use a square corner pan for clean corners bought at a restaurant supply store) with parchment paper. One piece should run the long way and another piece should run the other way and the paper should hang over the edges like a sling so the bars can be removed easily. Grease the parchment paper with coconut oil or light oil. Add the ingredients of the crust (dates, salt, cacao powder, pecans and coconut) and pulse until the pieces are broken up and the crust stays together when pressed between your fingertips. If its not coming together add a few more dates until it sticks together. Pour the crust into the bottom of the pan and press it firmly with the bottom of a greased flat bottomed glass or a greased spatula to form a flat surface. Place the crust in the fridge to set up while you assemble the rest of the bars. Cover the dates being used for the mousse bars in some hot water and set aside. In a small bowl add the coconut oil and the chopped unsweetened chocolate and microwave for 15 seconds at a time stirring in between until fully melted. (You can also do this on your stove in a double boiler). If there are still some small pieces of chocolate visible try stirring for a few seconds to see if they will melt so you don't overheat the chocolate in the microwave. Drain the dates and add them to a blender along with the pureed beets, salt, raw cacao powder, melted chocolate/oil mixture and blend until smooth. Drain and rinse the soaked cashews. Now add the cashews and blend until smooth. If the mixture is too thick start adding coconut milk 1 TBL at a time until the mixture can run smoothly in the blender but is still very thick. Taste for sweetness. If you like it sweeter feel free to add some maple syrup or sweetener of choice to your taste. Pour the mixture over the crust and use a spatula to smooth it out. Tap the bottom of the pan flattly on the counter to flatten the mixture out. Place in the fridge to firm up at least 3 hours. Remove from the pan and slice the loaf in 4 long equal pieces lengthwise and then slice across to cut the 4 pieces in half to make 8 long skinny rectangular bars. Serve with a scoop of coconut cream. Steam 4 beets until fork tender. Remove skin after steaming with gloves and cut up the beets into small pieces. Add the beets to a blender along with 1-2 TBL of the cooking water and blend until you have a smooth puree. Measure out 1/2 cup puree for this recipe. This recipe can be doubled to make a full cake using a 9'' spring form pan or a 9x9 baking pan. But I wont accept that yet so I will hold on to the season for one more day by making frozen desserts. You can’t tell me what to do! I can eat what I want! So what am I eating today in my rebellion of the seasonal change? Its a tropical granita with a vegetable hidden inside. So whats the sneaky ingredient…. Total shocker with that electric orange color right? This ones pretty simple, I just mixed freshly juiced organic carrots, pineapple, ginger, lime and sweetened it with maple syrup for this light, refreshing, and super nutritious Granita/ shaved ice dessert. Oh and here’s a sweet bonus the pineapple and ginger aid in digestion so this is perfect after a heavy meal or if you are having a little tummy trouble. 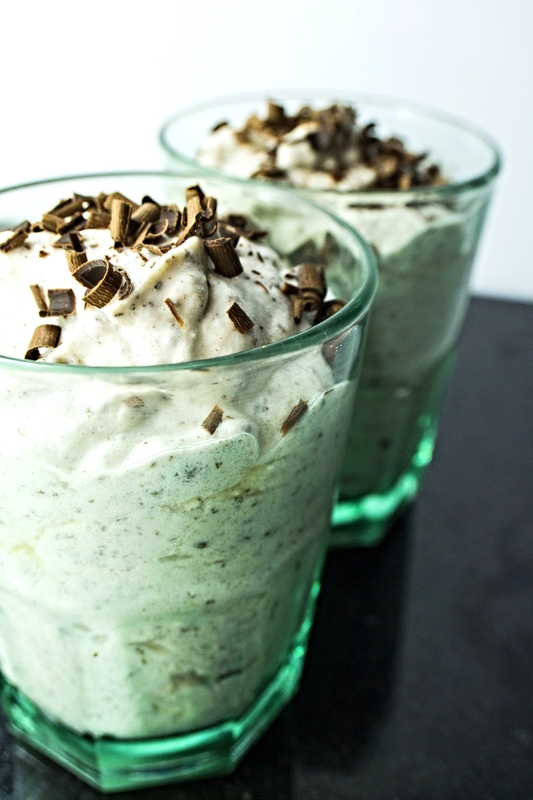 So hang on to summer for one more day with me and float away with this blissful frozen sneaky vegetable granita. Using a juicer, juice the carrots, pineapple and ginger (if using bottled juices simply combine them all in a bowl with a lid). Squeeze the lime into the juices and stir in the maple syrup and sea salt. Pour the juice into a 9 x 13 baking dish and freeze it for a good two or three hours. Return it back into the freezer for another hour or two, scrape again and repeat until the entire mix is frozen and scraped into ice pieces (usually takes about three rounds). If you have an ice cream maker place the juice mixture in the fridge for one hour to chill then churn according to your manufactures instructions. Spoon into bowls and eat! If you don't have a juicer finely chop up the ginger and add to a blender with 1/2 of the juice and puree until blended completely. Strain through a fine mesh strainer to avoid and ginger chunks add to the remaining ingredients and proceed with the recipe as written. I like to top my granita with fresh lime juice and layer with coconut cream if I'm in need of something a bit more decadent. Pudding can make life better. Nutella Chocolate Pudding can make life waaaaay better. Why is this pudding so special? Because this is a raw/vegan nutritional powerhouse pudding posing as a decadent dessert. The base of this is chia seeds, flaxseed meal, and hazelnuts soaked in your choice of dairy free milk (coconut milk makes this incredibly rich and decadent while almond milk makes a lighter pudding so choose accordingly). So we have Omega 3’s, fiber, & protein disguised as dessert! Pretty awesome combo if you ask me. The chia/flax hazelnuts needs about an hour to soak up and bloom but you can assemble those ingredients the night before and blend it up the next day. Crazy easy, super delicious, and deceivingly healthy. Soak the chia seeds, flaxseed meal, and hazelnuts in one cup of dairy free milk for at least one hour but 4-6 hours will soften the hazelnuts so they blend easier. Add the salt, cacoa, maple syrup, espresso powder (if using) and 1/4 cup of reserved milk and blend until smooth. If the pudding is too thick add the remaining 1/4 cup of milk until the desired consistency is achieved. Taste for sweetness and add more maple syrup if you like. The pudding is ready to eat but it can be covered and kept in the refrigerator for up to one week. If you want the smoothest possible pudding you will want to use skinless Hazelnuts. The skins can be removed by a few methods: If you do not follow a raw diet you can roast the hazelnuts for 15 minutes in a 350 oven or roast slow in a warm oven for 12 hours or in a dehydrator following manufactures directions and then place in between two kitchen towels and rub them vigorously. The skins should come right off. If you soak the hazelnuts overnight and then rub in between two towels the skins should come off easily as well. You put the lime in the coconut and cover it in chocolate! On my last post I made a raw pistachio date crust for my Strawberry Banana Frozen Cheesecake, and I am still obsessing over the crust! I love this crust so much I made it again, except this time I made a Banana Coconut Lime filling and covered it with homemade sugar-free dark chocolate, sea salt, and lime zest. Yeah these are pretty rockin, oh and they are also raw, vegan, gluten-free, sugar-free, Paleo, and stupid easy to make. Pulse 1/2 cup shelled raw pistachios along with 4 pitted medjool dates along with a big pinch of sea salt and the zest of 1 lime in a food processor. When the mixture is sticky, coarsely ground and holds its shape when pressed between your fingers you are ready to go. Line a bread pan with a piece of parchment paper fashioned as a sling so the sides hang over the edge for easy removal later. I also grease the pan and paper with coconut oil for extra insurance. Now pack the crust into the bottom of the pan making it as flat as possible. If the crust it sticking to your fingers simply wet your fingertips when touching crust. Place in the fridge while you assemble the filling. In a blender combine 3 ripe bananas, 3/4 cup coconut cream (if you can’t find coconut cream leave a can of coconut milk in the fridge overnight and then scoop the cream that is chilled on the top leaving any water in the can), the zest and juice of 2 limes, 1/4 tsp fine sea salt. Blend until a smooth mixture is achieved , add liquid stevia or sweetener of choice to taste and then pour into the crust. I like to zest additional lime on top before freezing. Place in the freezer to firm up for at least 4 hours but overnight is best. Take the pan out of the freezer and use a knife to separate the sides from the pan. Pull the whole thing out using your parchment paper sling and place on a cutting board. 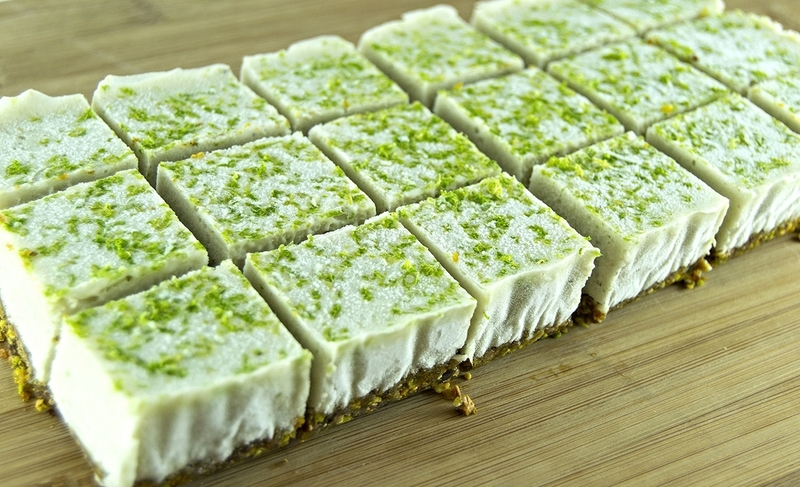 Cut into 1’‘ squares (this recipe will yield 18 squares). Place the cut squares on a rack with a sheet pan underneath lined with foil or parchment paper. Make sure that the squares are not touching and have at least 1’‘ (2.5cm) distance from each other. Return the squares to the freezer to firm up while you make the chocolate. Over a double boiler (or a sauce pan with a bowl over the top with 2 inches of simmering water, making sure the bowl does not touch the water) add 4 tbl melted coconut oil, 1/2 cup plus 2 tbl raw cacao powder and heat gently over medium low heat whisking constantly. When fully combined add 1 1/2 tbl sweetener of choice and 1/2 tsp vanilla extract off of the heat and stir to combine. Remove the ice cream bites from the freezer and generously pour the chocolate over each bite so it drips over the sides. The chocolate is going to firm up almost instantly so move fast. If you need more chocolate remove the rack and spoon off the dripped chocolate on the lined sheet pan (this is why we put down foil or parchment paper). After the chocolate immediately zest some lime over the top and sprinkle lightly with a coarse salt. I used a Himalayan Pink Salt but the choice is yours. These are ready to eat! Like anything frozen I like to let it sit for 10-15 minutes out on the counter to soften lightly before eating it. The colder something is the less flavor it has so by letting it defrost just a touch you will have a creamier texture and more flavor! In a blender combine 3 ripe bananas, 3/4 cup coconut cream (if you can't find coconut cream leave a can of coconut milk in the fridge overnight and then scoop the cream that is chilled on the top leaving any water in the can), the zest and juice of 2 limes, 1/4 tsp fine sea salt. Blend until a smooth mixture is achieved, add sweetener of choice to taste mix and then pour into the crust. Zest additional lime on top of the filling before freezing. Cut into 1'' squares (this recipe will yield 18 squares). Place the cut squares onto a rack with a sheet pan underneath lined with foil or parchment paper. Make sure that the squares are not touching and have at least 1'' (2.5cm) distance from each other. Return the squares to the freezer to firm up while you make the chocolate. Over a double boiler (or a sauce pan with a bowl over the top with 2 inches of simmering water, making sure the bowl does not touch the water) add 4 tbl melted coconut oil, 1/2 cup plus 2 tbl raw cacao powder and heat gently over medium low heat whisking constantly. When fully combined add 1 tbl sweetener of choice and 1/2 tsp vanilla extract off of the heat and stir to combine. Right after the chocolate is drizzled zest some lime over the top and sprinkle lightly with a coarse salt. These are ready to eat! Like anything frozen I like to let it sit for 10-15 minutes to soften lightly before eating it. Double the recipe and use a 9'' greased Spring-form pan or a greased and parchment lined 9x9 square pan for a full sized cake. This recipe is for two 5’‘ pie tart shells but if you double the recipe you can use a 9’‘ springform pan for a full size cheesecake. Prep for this recipe by soaking 1/2 cup raw macadamias or cashews (or 1 cup for a full size cheesecake) in just enough water to cover them for a minimum of 4 hours but overnight is best. Also place one can of full fat coconut milk into the fridge overnight for later use (If you can get your hands on a can of Coconut Cream then you can skip this step). Pulse the mixture until it is coarsely ground and becomes sticky. The mixture should stay together when pressed in between your fingers. If not process with 1-2 more dates until the desired consistency is achieved. Grease the tart shells or pan you are using. Press the nut-date mixture into the bottom of the tart shells/pan and firmly pack to make it as flat as possible. A flat bottomed greased glass is the perfect tool for this. You can bring the crust up the sides if you want but that is a personal choice. Place the prepared crusts into the fridge while you assemble the remaining ingredients. Open up the chilled coconut milk and scrape the cream off the top leaving the coconut water in the can. We just need the cream for this so feel free to drink the water or save it for a smoothie. Drain the nuts and place in the workbowl of a blender along with 2 Tbl of the coconut cream, the zest and juice of 1 lime, 1/4 tsp fine sea salt, 1 1/4 cup sliced strawberries and 1 ripe banana. Blend until very smooth and taste for sweetness. If you need it sweeter add 10-15 drops liquid stevia or 1 tbl of maple syrup, honey, coconut sugar or sweetener of choice. Fill the tarts almost to the top with the filling and place in the freezer to chill for at least 6 hours but overnight is best. You can add the pistachios later if you want. Top with sliced strawberries, pistachios, and extra lime zest right before serving. I like to let it sit out on the counter for 15 minutes (30 minutes for a full size pie) before serving so it has a creamier texture. Prep for this recipe by soaking the raw macadamias/ cashews in just enough water to cover them for a minimum of 4 hours but overnight is best. Place one can of full fat coconut milk into the fridge overnight for later use. 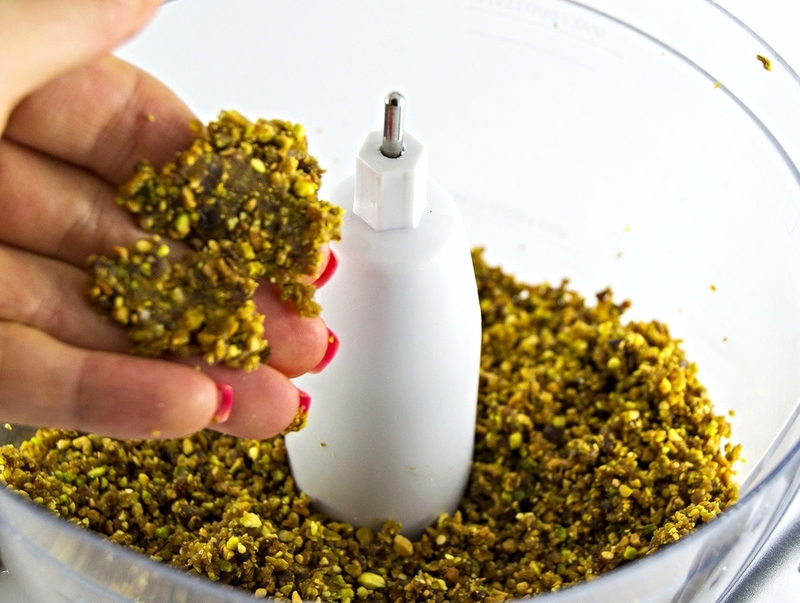 Start by placing the raw shelled pistachios and medjool dates with pits removed into the bowl of your food processor along with the fine sea salt and the zest of 1 lime. Pulse the date-nut mixture until coarsely ground and it becomes sticky. Press the nut-date mixture into the bottom of the tart shells/pan and firmly pack it to make it as flat as possible. You can bring the crust up the sides if you want but that is a personal choice. Open up the chilled coconut milk and scrape 2 tbl of the cream off the top leaving the coconut water in the can. Drain the nuts and place in the workbowl of a blender along with the coconut cream, the zest and juice of 1 lime, 1/4 tsp fine sea salt, 1 1/4 cup sliced strawberries and 1 ripe banana. Blend until very smooth and taste for sweetness. If you need it sweeter add 1 tbl of maple syrup or sweetener of choice to taste. Fill the tarts almost to the top with the filling and place in the freezer to chill for at least 6 hours but overnight is best. Top with the remaining 1/4 cup sliced strawberries, pistachios, and extra lime zest right before serving. Allow to sit on the counter for 15 minutes (for small tarts) 30 minutes (for full size pie) before serving to defrost. For a full size cheesecake double this recipe and use a 9'' springform, grease lightly with oil, and line the sides with parchment paper. I believe most problems can be solved, or at least greatly diminished, by food frozen desserts. Ice cream, frozen yogurt, popsicles…..I could survive solely on those items and die a happy girl. But dammit why does all the ice cream and frozen goodies in stores and shops have to have all of these gross ingredients added like xantham gum, corn syrup, and artificial food colorings???? No need to fret my dear, I can solve this problem with three ingredients and few hours in the chill chest. All you need is a blender, some awesome popsicle molds, non dairy milk, and some frozen fruit of your choice. Wait, you don’t have cyclone shaped popsicle molds? Simply fill some small paper cups and place lollipop sticks or leftover popsicle sticks in halfway through the freezing process (about 1 1/2 hours in) and voila! I will say though that these crazy fun silicone molds make the whole experience that much better so just pull the trigger already and buy some because you know you will be making these all summer. In a blender add all of the ingredients and puree until smooth. Add sweetener of choice to taste. If the fruit has seeds strain the mixture through a sieve. Pour the mixture into popsicle molds and freeze for at least 3 hours or until the pops release from the molds in tact. If you don't have popsicle molds use kiddie size paper cups. Fill the cups 3/4 way full and freeze for 1 1/2 hours or until the mixture is frozen enough to hold a lollipop or popsicle stick in the center. Freeze for an additional 2 hours and when ready to eat simply peel the paper cup away from the pop. Remember Chia pets? Those hilarious glass animals that grew grass hair when watered? Well you know those same seeds inside those toys, chia seeds, are actually edible, high in omega 3 fatty acids, and high in protein. In a container that has a lid, stir together the 6 oz of non-dairy milk and the chia seeds, and allow to bloom in the fridge covered overnight or on the counter for at least 2 hours. Place the bloomed chia seeds (they should be doubled in size and look gelatinous) and milk into a blender along with the blueberries, stevia or sweetener, and 2 Tbl coconut milk. Blend until a smooth and thick pudding is achieved. Eat immediately or store in the fridge covered until ready to eat. I have had a bug in my bonnet all week and that bug is lemon curd. I have been on a mission to make a refined sugar and dairy free version of this tart tangy and luscious spread….its been quite a week to say the least. This spread is so amazing on cookies, in a tart shell, stirred in with some granola or off a spoon standing up in your kitchen at midnight. I decided to take the traditional lemon curd and switch up a portion of the juice for grapefruit. I would encourage you to play around with some other citrus juices like orange, lime, or yuzu they all work interchangeably and don’t forget the zest will yield a lot more of the fruits flavor then the juice itself. Here is the recipe for my curd and scroll down for instructions on how to turn it into a Paleo lighter than air mousse that will rock you silly. Note: The citrus juice can be replaced by any other citrus juice such as orange, lemon, yuzu, etc just keep in mind the total juice required is 3oz. If doubling this recipe use 3 large eggs otherwise everything is else doubled properly. 1. Fill the pot with about one inch of water. Bring to a simmer over medium heat. 2. Combine the zest, honey, eggs and egg yolks in the heatproof bowl. Whisk together for one minute to incorporate the honey and yolks. Place the bowl over the pot with simmering water and whisk constantly for about 30 seconds, or until the honey is dissolved. 4. Add the grapefruit juice and lemon juice and cook, whisking constantly for 8 to 10 minutes, until the curd reads 160° F on an instant read thermometer and has the consistency of sour cream and coats the back of the spoon. Remove the bowl from the heat. 5. Use a spoon and scoop small pieces of the cold coconut oil one by one and whisk until it is completely incorporated. Strain the curd through a fine-mesh sieve into a clean bowl. 6. Cover with a piece of plastic wrap and push it into the surface of the curd to prevent a skin from forming. Chill for at least one hour to allow to firm up. Will stay for over a week covered in the fridge and up to 3 months in the freezer. In the bowl of a clean stand mixer (or metal bowl) begin to whip the egg whites and cream of tartar. When it starts to become foamy increase the speed and add in the honey or sweetener of choice and whip until medium firm peaks form. In a separate large bowl add the lemon curd and cashew cream and fold together. Then scoop 1/4 of the egg white mixture and stir it into the lemon/cashew mixture to make the integration of the rest of the egg whites easier. Then add 1/4 more of the whipped egg whites into the lemon curd and fold in gently. Continue to add the egg whites in these intervals two more times and fold gently until a light and fluffy mousse is attained. Cover with plastic wrap and allow to firm up in the fridge for at least an hour before eating. Ahhhhh chocolate….it really could solve most of the world problems. But whats a girl to do if she is trying to get all of those empty caloric white sugars out of her life? Make my own chocolate silly and now you can too! These are not as hard as you might think as long as you have a silicone chocolate mold, and luckily for you they are sold on amazon for about $10. So enough chat, lets turn that nostalgic PB&J sandwich on its head and put it into bon bon form. Giddy up. Chop the chocolate into pieces and place 3/4 of it in a small glass bowl and microwave for 15 seconds at a time. Stir the chocolate and continue to microwave for 10 seconds at a time, stirring in between, until the chocolate is smooth and shiny. Add the remaining 1/4 of the chocolate and stir until smooth. The chocolate should register 87 to 89 degrees F on a candy thermometer. Pour the chocolate into a flexible chocolate mold and swirl it around above a sheet pan until every corner of the mold have been covered. Using a bench scraper or a flat bottomed spatula scrape the mold so that all the chocolate is leveled off and pour it off onto a sheet pan. Scrape the excess chocolate back into the bowl to use again. Place the mold on a sheet pan to keep it level and place the leveled chocolates into the refrigerator for about 10-15 minutes checking after 10 minutes to see if the chocolate has set up. It should be somewhat firm to the touch and not leave a fingerprint when touched but do not leave it in for too long or else the chocolate with break when you open it. Remove the molds from the fridge and spoon 1/2 tablespoon of nut-butter into the center of each mold. Then place 1/2 teaspoon of jam into the center of the nut-butter. Place in the fridge to set up for 5 minutes. Sprinkle each bon bon with a small sprinkling of coarse sea salt. Place back on the sheet pan and into the refrigerator to set up for at least 15 minutes and up to 20 depending how thick your chocolate is. Test one to see if it comes out and if it cracks place it back in the fridge to set up longer. Happy Tuesday to all my gorgeous gluten-free readers!!! In case you live under a rock Thursday is Valentines Day. I have mixed feelings about the holiday in general, but the one part that I do approve of is the unabashed excuse to eat chocolate! Now for all you love birds out there that have a date I strongly encourage you to make something from the heart rather than buy a premade box of terrible unhealthy chocolates (especially if your valentine has a food allergy or diet requirement). And if you are riding solo, like me ;) go ahead and make a batch for yourself. Aint nothin wrong with that and you can’t tell me otherwise. Always remember just because it’s a special occasion doesn’t mean anyone should go without so this recipe is gluten-free, vegan, paleo, and freaking delicious! Did I mention its way easy too? Ok just checking. Lets make some magic!!!! Place the banana in the work bowl of your food processor (if you have the small work bowl attachment that would be even better or mash finely with the back of a fork). Puree the banana with short pulses until it is a smooth paste. Add the finely chopped chocolate on top of the banana. Heat the coconut cream in a small sauce pan over medium heat. Allow to heat until steam starts to form on top of the milk making sure to not allow it to come to a boil. Pour the hot coconut cream over the chocolate and banana mixture. Allow to sit for one minute. Then cover and pulse the food processor until a fine smooth mixture. Cover with a saran wrap so that it touches the surface. Refrigerate it until it is firm enough to scoop and roll, about 1 hour. Do not wait too long because if the mixture becomes too cold it will be difficult to work with so start checking after one hour. Pour the cocoa powder into a shallow bowl or a plate with high sides. Dust your hands with cocoa powder and use a small candy scoop or a large melon baller to form small balls from the ganache. Roll them in your hands one at a time to form a round ball. Place the formed balls into the bowl with the cocoa powder 5 at a time and shimmy the bowl or plate back and forth lightly so the truffles roll around and become covered by a thin later of the cocoa powder. You could also roll them in finely ground coconut. Keep in the fridge until ready to eat.